A. Giroux; Paris, Delteil, 18 April 1904, part of an album in which the pages were numbered as in this lot. 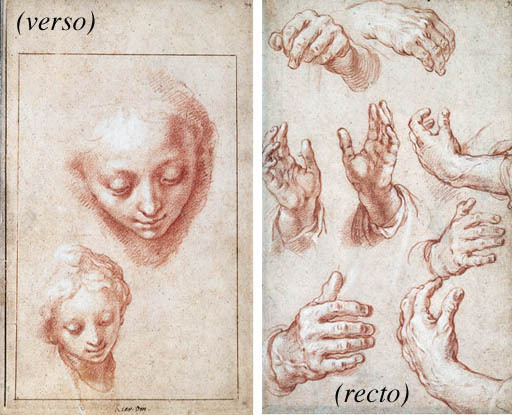 The present drawing belongs to a series of studies of heads, hands and arms which were intended to be kept in the artist's studio to serve as references for the master or his students when they wanted to elaborate a new composition. The series was engraved by Bloemaert's son Frederik and published in eight volumes as the Konstryk Tekenboek, which in its later editions was very widely distributed. The prints were among the earliest examples to imitate the drawing. The heads on the verso of the present sheet are very similar to those engraved in the Tekenboek as no. 30. The recto and verso might perhaps have been used as studies for an Adoration of the Kings or Holy Family. Many of the double-sided sheets have reappeared in France, and an entire album was dismembered at the Delteil sale in 1904. The small number on the upper right and left corners of the sheets from this album allow them to be easily recognised. Another album was probably available in the 18th Century to French artists in residence at the French Academy in Rome. There are copies of the same drawings by Boucher and also by Subleyras. Boucher engraved many of these studies after the master in a series entitled Livres d'études d'après les desseins originaux de Blomaert(sic), published in 1735. Similar drawings were sold from Alfred Normand's collection, Christie's Monaco, 20 June 1994, lot 76 (with similar ink framing lines to that on the present sheet visible on the recto) and at Christie's Amsterdam, 9 November 1998, lot 37. J.Pz. Zoomer (L. 1511), with his inscription 'keer om' [turn over] (verso). This drawing is sold unframed.